Since Eskolta’s founding, we have worked extensively with the New York City Department of Education to understand the impact of City initiatives and policies on educators in the City. Our research study on a citywide initiative to increase teacher leadership opportunities offers an example of Eskolta’s research work focused on understanding how district policy rollout affects educators and can be improved. It also provides a window into the state of teacher leadership in the largest school district in America. In the 2014–15 school year, Eskolta was commissioned by the NYCDOE’s Office of Teacher Recruitment and Quality to conduct a study on the development and impact of teacher leadership opportunities across the City. One hundred seventy-eight principals, 641 teacher leaders, and 3,922 teachers across 392 schools participated in the study, providing a broad sample. Participants responded to a survey soliciting information on the level of collaboration between teachers and leadership at their school, the use of the Danielson Framework and its impacts on their teaching, and their satisfaction with and commitment to teaching. This study resulted in four policy briefs, each highlighting one major insight from the data that was collected. 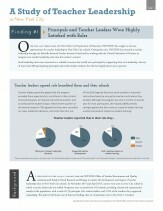 Main findings from the study reveal that while impact and satisfaction differed by the type of role among teacher leaders (peer coaching vs. modeling roles), principals and teacher leaders across the city reported high levels of satisfaction with the value added to their school in having teacher leadership roles. At the end of a year of having teacher leaders in the building, four out of five principals (82%) reported that their teacher leaders were helping them to support instruction in the building. The other benefits identified in the study include more frequent collaboration between teachers, teacher leaders, and principals. This collaboration led educators to feel supported in their professional development, see their own strengths and weaknesses, and see the value in the Danielson Framework for improving practice. The study also found that teachers who worked with teacher leaders reported greater commitment to teaching. Teachers who worked with a teacher leader more than once a month were 10 percentage points more likely than their peers to report that they wanted to stay in the teaching profession (78% vs. 68%). Teachers in the program were almost twice as likely (58% vs 33%) to report that they had a say in instructional decision making. 68% of principals agreed that having teacher leaders helped them to retain their best teachers. Four out of five (81%) teacher leaders agreed that teacher leadership had a positive impact on both their own learning and their school’s development of effective instructional practices.